Well, I did it!! 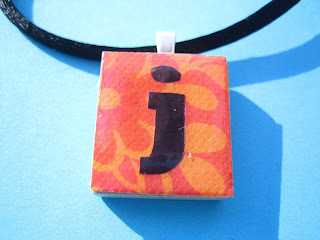 I jumped on the Scrabble necklace bandwagon! I couldn't help myself, I just LOVE them. I love the size, I love the many ways to personalize them, I love the color, I just love, love, love them!! It feels like it's been forever since my last post, and in "blog world," it has been!! It's been a very busy two weeks for me! 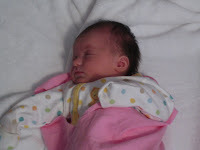 Obviously, I've been spending TONS of time with Kaitlyn, the new grandbaby. I've had jewelry orders that I've been trying to squeeze in when I can. I've been making Mother's Day bracelets, a wedding bracelet, and First Communion gifts. My husband and I went to the Van Halen concert that was postponed from March...which was very awesome by the way!! I'm not a David Lee fan, but he did a great job for an old rocker! I was impressed by his kicks and his abs :) Eddie seemed very sober and sounded great -- he played very well!!! Wolfie did a nice job also. He didn't move a whole lot, but this is all new to him. Alex....well, Alex was soooo awesome!! He so talented but doesn't get the spotlight like his brother does. His drum solo was the best I've ever seen. 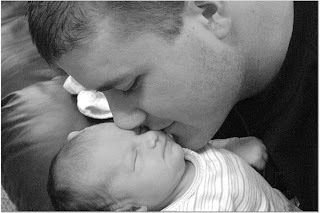 I just had to post this beautiful picture of my grandbaby (Kaitlyn) and her daddy (Monty, my son in law). I think it's so touching! My daughter took it when they got home from the hospital. It's very obvious already that Kaitlyn will be daddy's little girl. Kaitlyn is now 4 days old! She came home yesterday and still sleeps most of the time. When they got her home, my son in law videotaped her in every room of their condo. She slept through it all, but it will be a nice momento when she gets older. Years ago, hospitals would make little baby bracelets with the baby's last name. Since they don't do this anymore, I made Kaitlyn a name bracelet for her baby book. It's only 3 inches long :) Eventually, I will sell them in my Etsy shop. Once things get back to normal I can list a few. The new grandbaby is FINALLY here!! 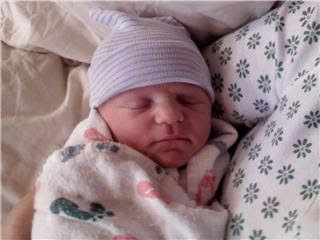 Kaitlyn Marie was born Friday, April 11. She is very healthy and very sweet! Unfortunately, she had to arrive by c-section because she had the cord wrapped around her neck and arm. My daughter is doing very well considering what she's been through :) She's a tough little one! We had kind of prepared ourselves for a c-section because she's so tiny. We are very thankful everything went well and both are safe! I FINALLY got a few Mother's Day bracelets made!! The first one is a custom order for Christy. 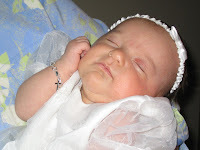 She already had the Adam bracelet, and wanted her new baby's name (Phillip) added. It is made with sterling silver and gold filled beads. 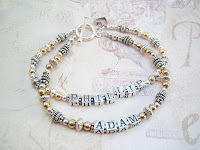 I took 'Adam' apart and strung the new name along with it on a double clasp. The second bracelet I made is for the mother of one or two children. I used clear Swarovski crystals (April) and white pearls (June). 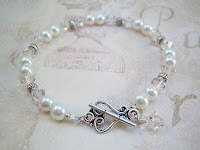 The last Mother's Day bracelet is for the Mother of a child born in February. 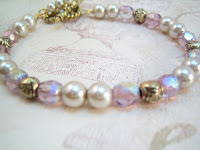 I used amethyst fire polished crystals and beige glass pearls. I also added some gold-plated rose beads and a gp toggle clasp. I think this one is my favorite! This is a Flickr badge showing public photos from Trendy Treasures tagged with etsy. Make your own badge here.